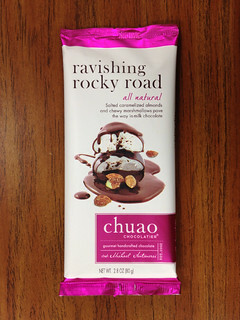 Since Chuao is a brand I love and trust, I picked up this Ravishing Rocky Road bar on my last chocolate buying spree. I was expecting big chunks of "stuff" embedded in milk chocolate, and as you can see from the following picture, Chuao did not disappoint. This bar is a craving killer - it hits you with the triple threat: sweet, salty, and chocolate (which is a totally separate craving from sweet). 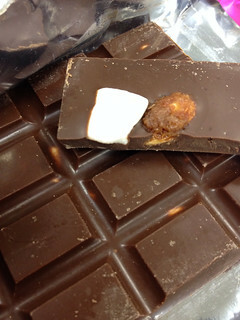 The chocolate was a rich brown with gorgeous hunks of marshmallow and almond inside. Some bites were just creamy, smooth milk chocolate, and these bites melted easily and without that stickiness that some milk chocolates have. Other bites had the caramelized almonds, which had a great combination of salty and sweet, as well as some nice toasty flavor - all of which went well with the milk chocolate. Still other bites had mini marshmallows inside, which had a delicate marshmallow flavor that held up all right next to the chocolate. The marshmallows were a bit firm, but the texture didn't bother me. The almonds were my favorite, but I loved the combination of textures and flavors because each bite was a little different. It was a lot like eating Rocky Road ice cream! Welcome to Snack Love, a casual blog dedicated to reviewing things that include but are not limited to candy, snacks, gum, and soft drinks! Thanks for visiting!